Commodity prices are ever changing, due to continuously shifting market information. Both the price level and amount of volatility change over time. Looking at futures prices can immediately inform us of the current price level , and yes it is up - way up since just last year. It takes a few more calculations to determine the level of price volatility. In this short article I look at the corn market to analyze the relationship between overall price levels and price volatility; I also compare the current relationship to past situations. Identifying the level of price volatility or risk in the corn market coupled with current price levels can assist producers in making marketing decisions. High prices with low volatility could be taken as a sign that prices may not move much over the next few months. High prices with high volatility could be taken as an indicator of more future price swings. Producers wanting to sell grain in periods of high volatility must be prepared to pull the trigger when price expectations are met. In this analysis I use weekly averages of corn prices in the Illinois cash market from the 1992/93 crop-year to the 2010/11 crop-year. While using weekly averages hides the day-to-day variation it does show variation between weeks. Yearly averages are computed by taking the average of weekly prices. Price volatility is analyzed using the standard deviation. The standard deviation measures the amount of variability around the average. A higher standard deviation implies more variability and consequently more risk. The opposite is true of a lower standard deviation. Ideally, price averages are high and the standard deviation of price (volatility) is low. If we graphically portray the price average and volatility each year, values in the upper left hand zone are preferred (high price with low volatility) (Table 1). Points further to the right represent years that show higher volatility, while observations higher on the vertical-axis correspond to higher prices. 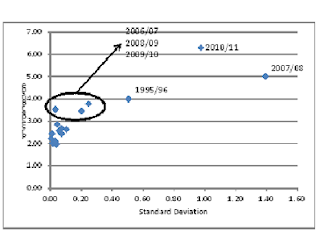 Three crop years, 2006/07, 2008/09, and 2009/10 saw higher price averages and lower standard deviations. Conversely, in no years were price averages low and standard deviations high. In the most recent five crop-years, three have seen higher-than-normal average price and low standard deviations, while the other two saw higher average prices and record high standard deviations. Notably, the most recent crop year, 2010/11 has had a record high average price and second largest standard deviation. Producers should consider this information in developing their 2011/12 marketing plan. In times of high volatility the producer needs to be ready to pull the trigger when prices hit pre-determined goals because they may not stay there long. Prices could very well go higher than expectations and this can be handled by selling in smaller percentages, not being over-run with emotion from selling at lower prices when prices keep rising, and ready to make additional sales as prices rise. Higher volatility implies higher highs and lower lows. Producers need an exit plan to handle lower prices. This can be addressed by using decision dates in making sales. If your price expectation is not met by a certain date you make the sale at the current cash price. Figure 1. Price per Bushel vs. Standard Deviation for Corn Price from 1992/93 to 2010/11. The 2011 Kentucky Corn Hybrid Performance Test is now available online. The test is also linked at the Corn Testing Website. The multiple location average is the best overall indicator for hybrid performance for next season. Look at hybrids that performed near the top (with one least significant difference of the top-yielding hybrid). Hybrids from several companies and hybrids containing several genetic packages did well. Compare the university data to other hybrid tests from independent sources. The 2011 Corn for Silage Performance Test is also available. This test reports hybrid performance (forage yield and forage quality) for two locations. Again, the multiple location average is the best indicator for hybrid performance for next season. The Midwestern states of Illinois, Iowa and Indiana are above 92% harvested for corn and above 97% harvested for soybean. Ohio is not as far along with 89% corn and 96% soybean harvested. Like Kentucky, all of these states are ahead of schedule for harvest. Yields from the combine have been all over the board. One farmer said that he harvested his best corn ever and his worst corn ever... in the same field. Over the next few weeks, we will get a much better picture of how harvest finished. The overall shorter growing season would imply yields below trend, but the most recent estimates for yield were increased some.